Anguilla is a small island nation in the Caribbean with some of the best white sand beaches and gorgeous bays in the world. Two renowned resorts are in Anguilla – Cap Juluca and the CuisinArt. There are a limited amount of flights to Anguilla and the result is flying into Anguilla is expensive for the Caribbean. Limited flights also means that flights time are not ideal. A sample itinerary for December includes significant connection time in San Juan, Puerto Rico. This means that you spend a whole day traveling and that is not how anyone should spend their vacation day traveling to the Caribbean. 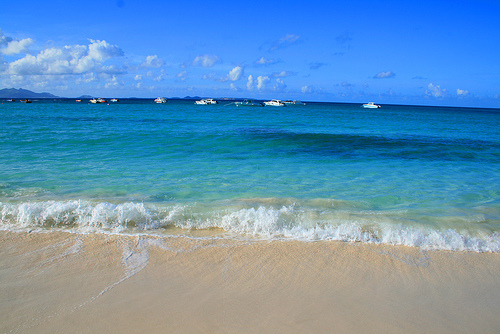 The ideal Caribbean trip means you are on the beach by 1 or 2PM. So what are the more optimal way to get to Anguilla? Looking at the map, Anguilla is just due north of St. Maarten, which opens up alternative transportation to Anguilla. 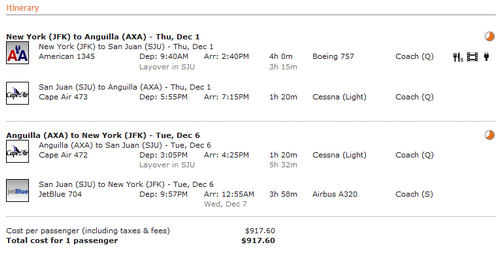 Flying into St. Maarten is $485. Now that you are in St. Maarten, how do you get to Anguilla? There is a regular ferry service at Marigot (French side of St. Martin) to Blowing Point, Anguilla. The ferry is only 20 minutes and runs every thirty minutes for approximately $20 each way. In addition, there’s a departure tax of approximately $15. The ferry service is unreserved — when you arrive at Marigot, put your name on the ferry service list and you are good to go. The total cost of flying into St. Maarten and then using the ferry is about $540. That’s a saving of over $370. But it is just not saving money, this travel hack actually gives you more on the beach. And having more time on vacation is always a plus on our books. Also, for those who are country collectors, this is an easy way to get two stamps on your passport at very low cost. It is good to look at alternative transport for smaller islands in the Caribbean. Currency: Netherlands Antilles Florin (French Side) or Euro — but US Dollars are widely accepted. If you have a destination in mind and find the airfare to be expensive, maybe we can help. Send us a message on our Facebook Page with the destination and maybe you will be our feature for a Monday Travel Hack!